Cursing is invoking the assistance of a spirit to help you inflict suffering. Swearing on the other hand, is invoking, only the witness of a spirit to an statement you wish to make. Madge: Meet Madge. Madge likes food and companionship. Madge likes grain, apples, carrots, grass, hay, or anything else a mule would like to eat. Madge likes lazy, cool days with lots to eat. Madge mainly likes FOOD. Mack. Meet Mack. Mack has anger issues. He is angry because Madge never pulls her weight. He is angry because she always steals his food. He is angry because he is old. Mack is angry. Farm News: OK – back to the quote: cursing. As most of you know, I’ve committed to horse power this year. Well – one thing to remember – you can’t be in a rush with horses (or mules). We had a rough week cultivating – or actually hilling potatoes. I did a lot of cursing, (oops I mean swearing) – loud swearing- and I am hoping the neighbors did not hear me!! In my defense, a LOT of potatoes lost their lives! Furniture of the week: Again – not a great picture. But – one of my favorite pieces. Price: $500. If you are interested, I can send more pictures. What’s in the bucket: Lots of lettuce!! Green and red lettuce, french breakfast radishes, spring onions, kale, turnip greens, marjoram or rosemary and beet greens. Main Street Market Items Available: Lettuce, french breakfast radishes, spring onions, kale, turnip greens, Circle S ground beef. Special: lotta lettuce 2 for one special. This is a simple pleasure, dressed up with an herb compound butter and lettuce greens. 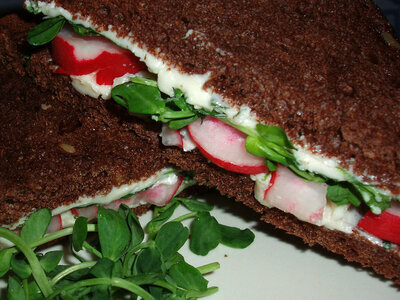 If pale pink French breakfast radishes are unavailable, substitute red globe radishes. Allow butter to soften, and stir in herbs. Spread a layer of herb butter on one side of each piece of bread. Lay out four pieces of bread, butter side up, and arrange a layer of radish rounds on top of the butter, followed by a layer of torn lettuce on top of that. Top with a second piece of bread, butter side down. Slice diagonally into two triangles and serve. This entry was posted in Circle S Farm News on May 21, 2016 by Letty. Circle S 2019 CSA celebrates 15 years. Don’t miss your chance to sign up!